WEDNESDAY, Feb. 3, 2016 (HealthDay News) -- Tackling should be eliminated from youth football due to the risks that collisions and head injuries pose to young athletes, a researcher argues in the Feb. 4 New England Journal of Medicine. A recent evidence review conducted by the American Academy of Pediatrics (AAP) found that tackling is "associated with pretty much every negative outcome" in youth football, including concussions and severe injuries, said researcher Kathleen Bachynski. She is a doctoral candidate at Columbia University's Mailman School of Public Health in New York City. Despite this evidence, an AAP policy statement issued in the November 2015 Pediatrics didn't recommend that tackling be eliminated from youth football. Instead, the AAP's Council on Sports Medicine and Fitness said coaches and officials should teach safe tackling techniques to kids, and make sure that rules against illegal tackling are enforced. "I felt given the risk they described, they should have made some stronger recommendations," Bachynski said. "Given the evidence, we should consider a more fundamental change in the way football is played, that might include removing tackling." The National Football League's ongoing concussion crisis has raised concerns at all levels of football about the effects of head injuries on players. Autopsies have shown that a number of prominent NFL players, including "Iron Mike" Webster and Steve Baul "Junior" Seau, suffered brain damage as a result of the repeated hits they took during play. Many parents are concerned that not enough is being done to protect youth football players from head injuries, according to a recent HealthDay/Harris Poll. In the poll, four out of five people said that aggressive tackles that can lead to head injuries should be restricted in youth football. That's the stance taken by the AAP, which recommended in its statement that "head-up" tackling be required in youth games to limit the risk of head-to-head collisions, which often result in concussions. The AAP policy statement recognized that "removing tackling from football altogether would likely lead to a decrease in the incidence of overall injuries, severe injuries, catastrophic injuries and concussions" in youth players. "The American Academy of Pediatrics recognizes, however, that the removal of tackling from football would lead to a fundamental change in the way the game is played," the statement continued. "Participants in football must decide whether the potential health risks of sustaining these injuries are outweighed by the recreational benefits associated with proper tackling." 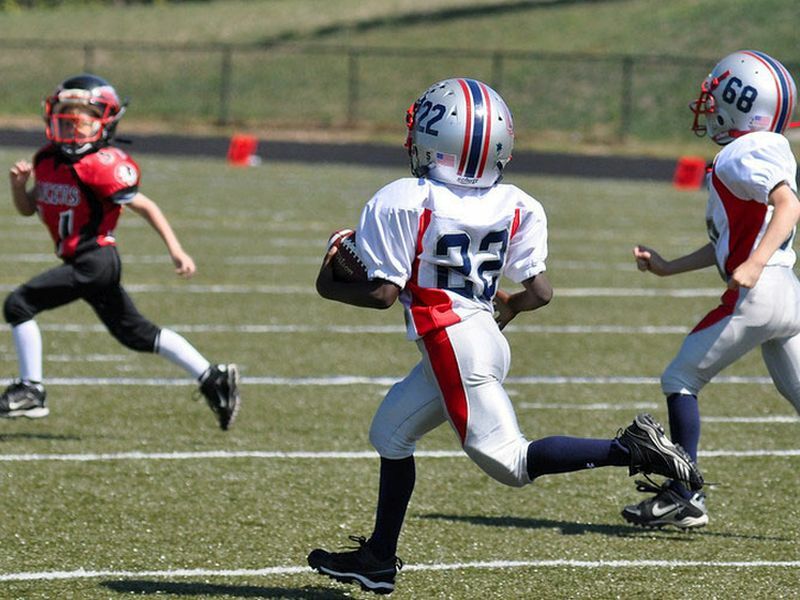 Dr. Cynthia LaBella, chairperson of the AAP Council on Sports Medicine and Fitness, said the committee took its stand following a "data-driven" review that balanced the risks of youth tackle football versus the benefits. "We didn't find the data supported a ban on tackling," said LaBella, medical director of the Institute for Sports Medicine at the Ann & Robert H. Lurie Children's Hospital of Chicago. "Our statement recommends that officials and coaches must enforce the rules of the game, including proper tackling techniques, and every effort should be made to reduce blows to the head." The AAP review found that tackling is the most common activity associated with injuries in youth football, but LaBella said injuries are not limited to football alone. "Right now football is in the spotlight, but it is important to remember that overall injury rates in youth football are similar to other youth sports, such as baseball and soccer, and that concussions occur in all sports," LaBella said. "In my clinic, I probably see just as many if not more female soccer players with head injuries as football players with head injuries." In her article, Bachynski stated that the academy took a much stronger stand against youth tackle football in the 1950s, when a panel recommended that body-contact sports such as tackle football be excluded from athletic programs for kids 12 or younger. But as football grew in popularity, the risks of injury came to be overshadowed by the potential benefits of team sports, she wrote. The benefits of youth football were one of the considerations that the AAP council weighed in crafting the policy statement, LaBella said. "Organized sports have so many benefits for kids," she said. "One of the risks of all organized sports is injury. However, for most kids and teens, the benefits of youth sports outweigh the risk of injury." The academy also recommended expanding the availability of non-tackling football leagues for young athletes. Bachynski believes those types of leagues should be the only options available. "I understand how beloved football is in many communities, but it would be better to participate in flag or touch football," Bachynski said. "I think flag or touch football is the way to enjoy the fun of football without the physical contact and the risk of head injuries. I would recommend against tackle football." LaBella said the AAP likely will review its policy statement on youth tackle football in three years, which is about the same interval at which it reviews any of its positions. "Usually it takes that long for a significant amount of new data to be produced that would warrant making changes to the policy statement," LaBella said.